the Neponset, the Sudbury, and Assabet rivers. But these rivers weren’t always beautiful–in fact, years ago they were, frankly, more or less sewers. And so people turned their backs on them. In many places where these rivers flow, the waterways are almost anonymous. No signs tell you which river you’re looking at. No walkable paths follow the banks of the river. But that has begun to change in the last number of years. 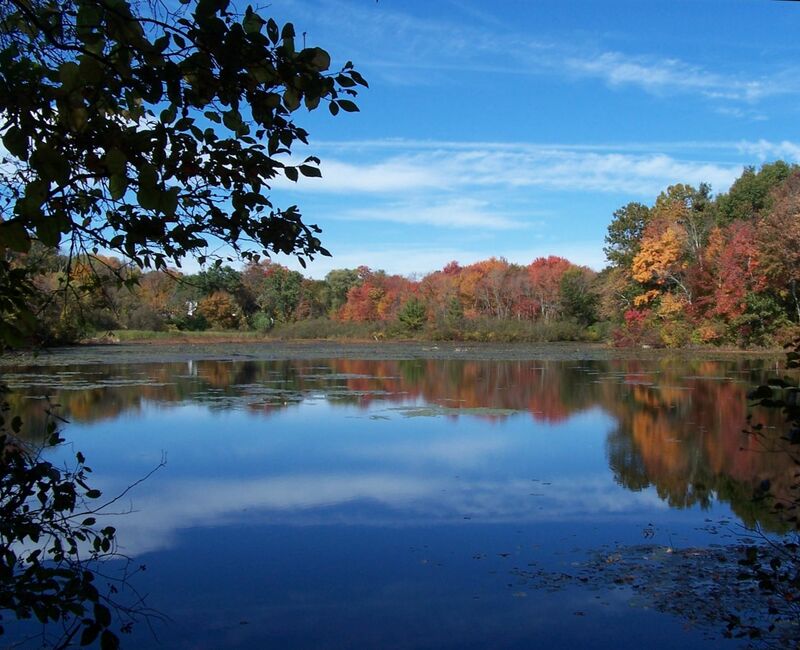 The Blackstone Valley Heritage Corridor has now become the Blackstone Valley National Historical Park! The Upper Charles Trail is being developed and has become a “go to” destination for local residents. Some towns appear to understand that open space and local trails are a true asset and deserve to be publicized. 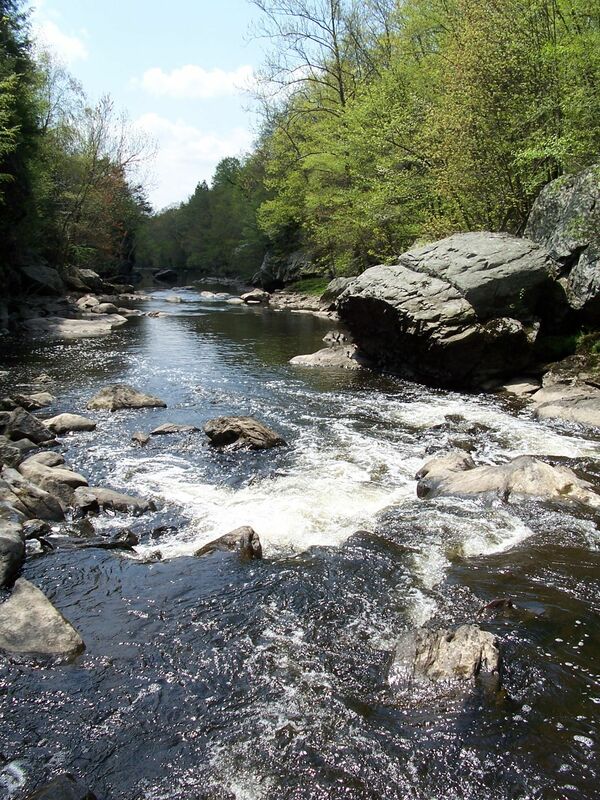 Other towns are not as well-organized, and information about trails, and access to the rivers that flow through these towns is more difficult to obtain. Thus began my accidental quest several years ago. 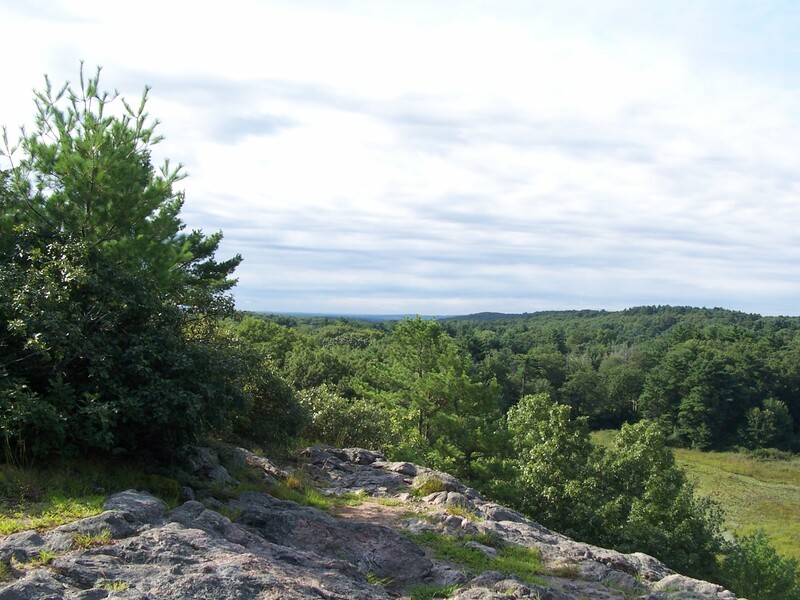 Spurred by one question, “Where’s Joe’s Rock?” I now keep my eyes open as I travel the area, looking for tell-tale signs; small parking areas with a path leading into the woods. A trail sign, or a kiosk, often the product of an Eagle Scout project. Sometimes the kiosk will even offer a map! I walk many trails seeking to learn whether the path is one I would point others to. There are trails I say, “Yeah! 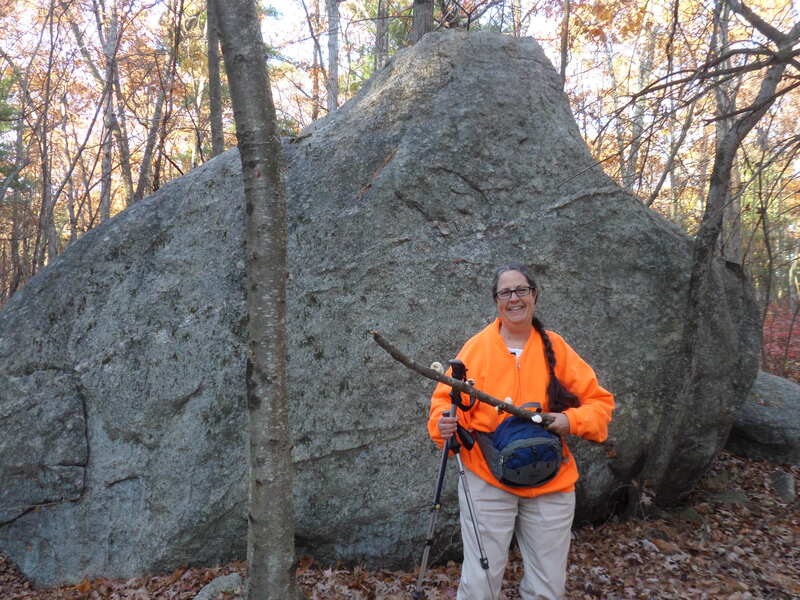 an Easy Walk,” while others leave me feeling worn out, a bit frazzled, and glad to return to the trailhead. You see, I live with a right leg that has substantial paralysis. Yes, I can walk–a lot! but my foot and ankle are limited in function, and steep inclines, lots of rocks and roots are difficult for me to navigate. My walking sticks allow me to travel on many trails, but “Easy Walks” are trails that permit me to stop watching my footing every single step. Rather, I can look up! enjoy my surroundings, spy mushrooms, turkeys, even an occasional deer. 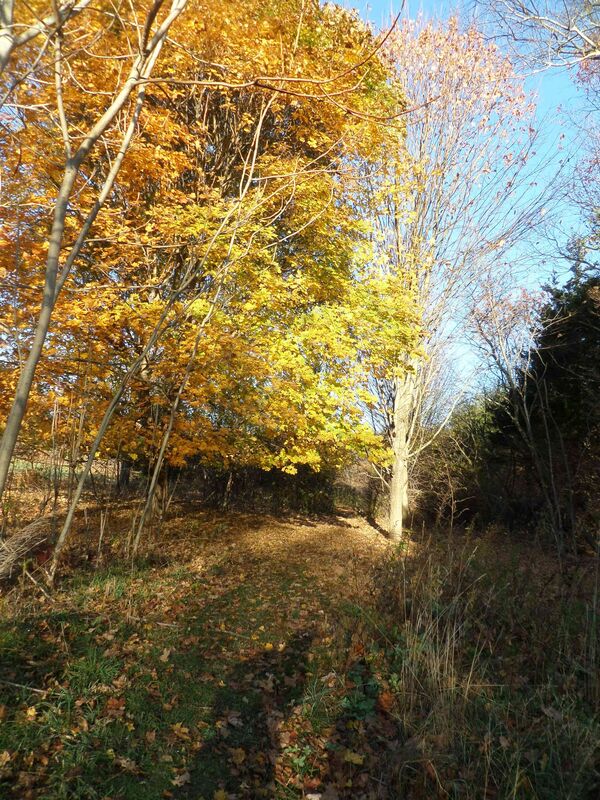 In the fall I stroll the woods stunned by the trees ablaze with color. In the past several days I’ve enjoyed a number different type of hikes. 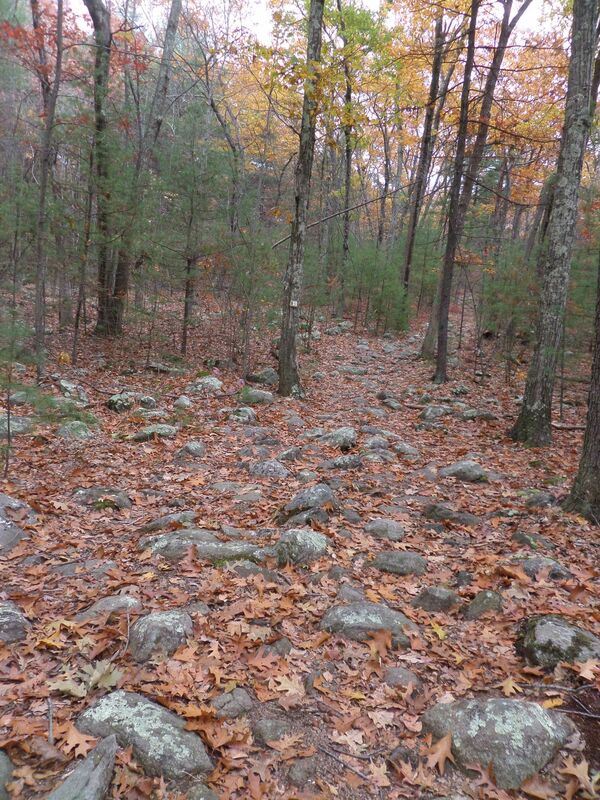 One was mostly an easy walk, with lots of boulders strewn through the woods, the Adams Street Trail in Holliston. 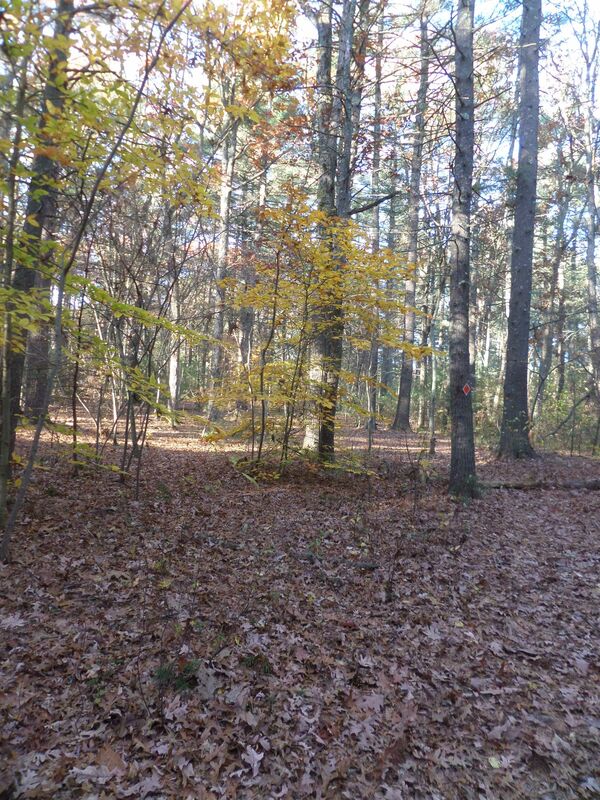 Another was surely NOT an Easy Walk, the Wolf Hill Trail in Smithfield, RI. Filled with rocks, roots, steep inclines, ups and downs, the trail was beautiful, but very difficult for me to walk on. Mercer Lookout, along this trail, was farther than I could go. We did, however, reach the airmen’s memorial, a moving tribute to lives lost during WWII. 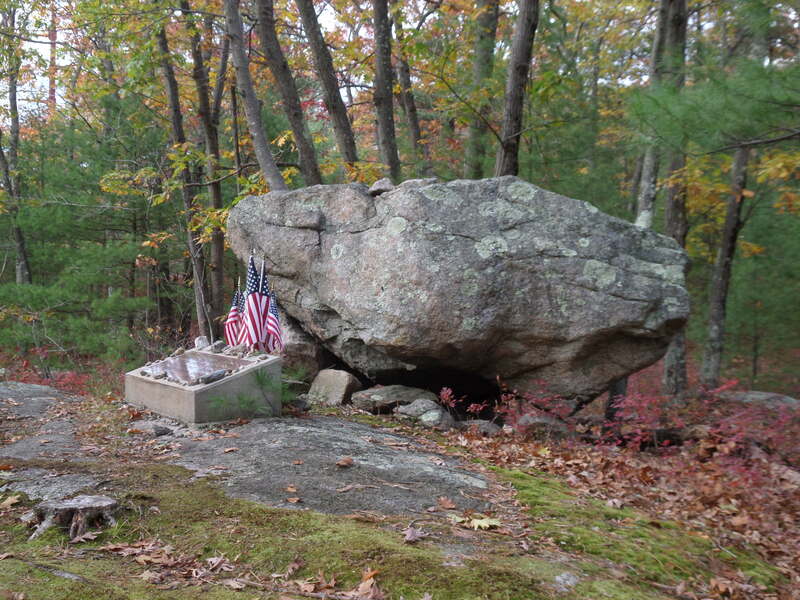 The memorial is surrounded by woods and massive rocks, and is not easily accessible. As such, it is a quiet, solemn tribute in a sacred space in the woods. I traveled another “Not so easy” trail yesterday in the Douglas State Park. Marked on the map as the “Coffee house loop,” it was beautiful, at one point filled with mountain laurel that will provide stunning flowers come next June. The path was rocky, rolling, about a 2+ mile loop. 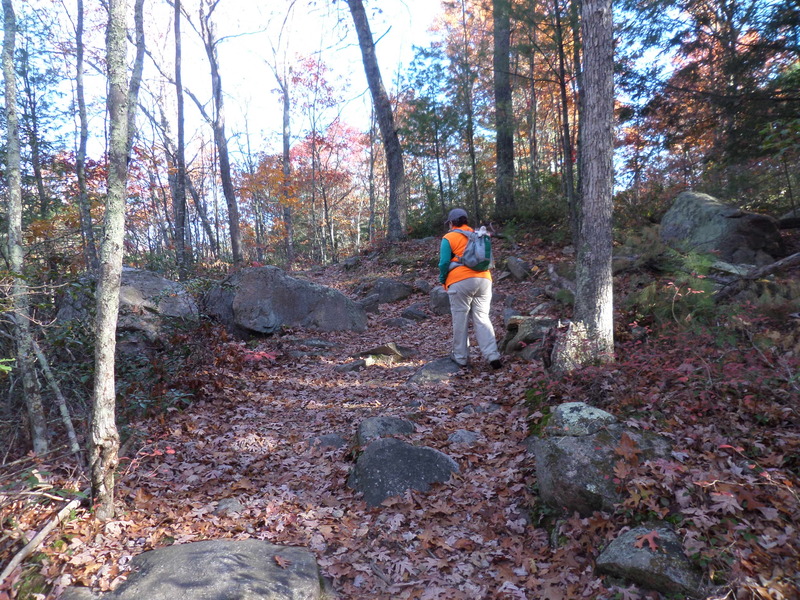 If the trail had been shorter, if there were fewer rocks and roots and fewer steep inclines, it might have qualified as an Easy Walk. As it is, I’m going to leave that trail for others who are more able than I am. I’m not sorry I walked the trail, however, since it was fun spending time walking with my friend Sue, who shares my love of the outdoors. guided me to a small trail in MiIlis, with parking directly on Village Street. 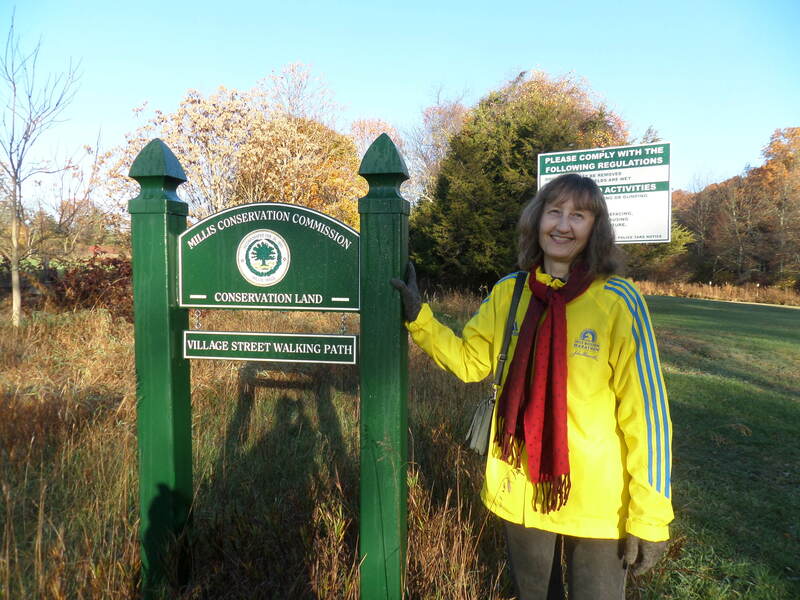 Jennifer has been a walking companion for several years now, so I was tickled to hear that she and her husband had discovered a local trail she thought might be a candidate for the Easy Walks book series. We found a broad, open meadow, some woodland with a well-marked loop trail, and spotted a flock of turkeys as we walked. The path was level and soft, filled with recently shed pine needles. Even the most difficult trails have something to offer travelers, but many of us have limitations of one sort or another. Perhaps you’re a young mom who wants to get your littlest ones outdoors. Easy Walks are good choices when introducing children to the outdoors. Or maybe you’re older, and need trails that are gentle on sore knees. Smooth paths make for places you look forward to returning to. Regardless of age, you may have mobility limitations. Easy Walks point to places people of many abilities can enjoy being in the outdoors together. 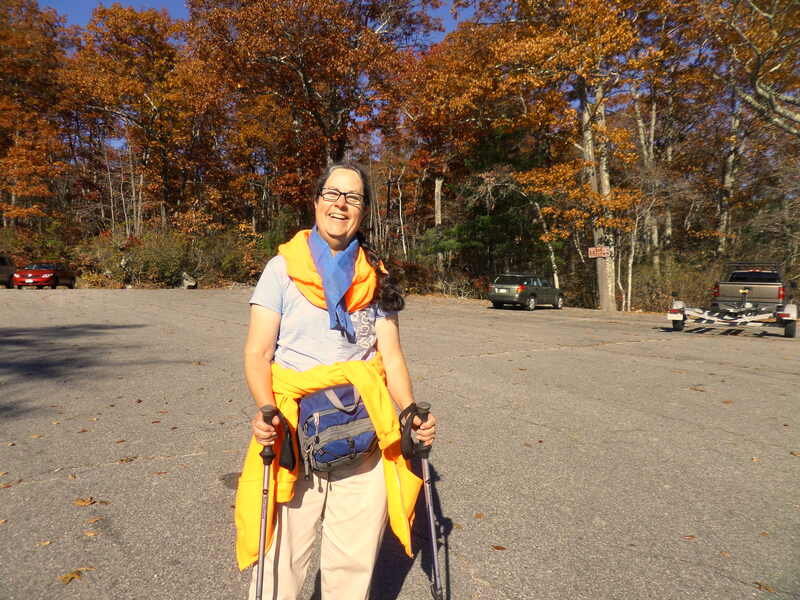 At the end of a fun walk, wearing my blaze orange in the fall! Regardless of your reasons, it gives me great joy to share what I learn with you. Enjoy, and Happy Trails!